I can't say enough how easy these are!!!! Hoping that you think so too when you view this tutorial! I am thinking of making holiday sets. Make a set and tie up with a ribbon. Voile! A hand made gift that keeps on giving! 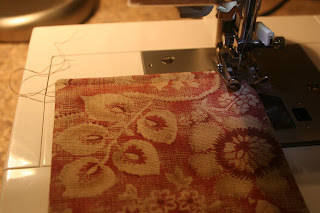 For this project, I had a bunch of scrap pieces of fabric from my window treatments, birdhouse quilt, and pillow in my studio. Step One: Cut fabric. 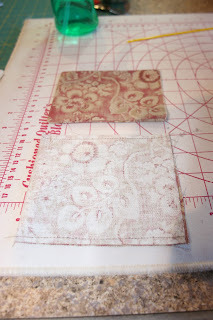 Each coaster should be 4 1/2 inches x 10 inch pieces. Step Two: Cut Batting. Each coaster needs a 4 inch square of batting. Step Two: Fold the fabric in half, right sides together to form a 4 1/2 inch x 5 inch rectangle. Step Three: Sew the 5 inch sides, so you have an opening at the end of the rectangle. Step Four: Trim corners, and turn the fabric right side out. Step Five: Tuck the batting in between the two layers. The first time was a bit tricky, but since I used a low-loft batting, so it seemed to lay flat easily. Each time I did another, it became easier and easier! Step Six: Fold the coaster's open ends in. 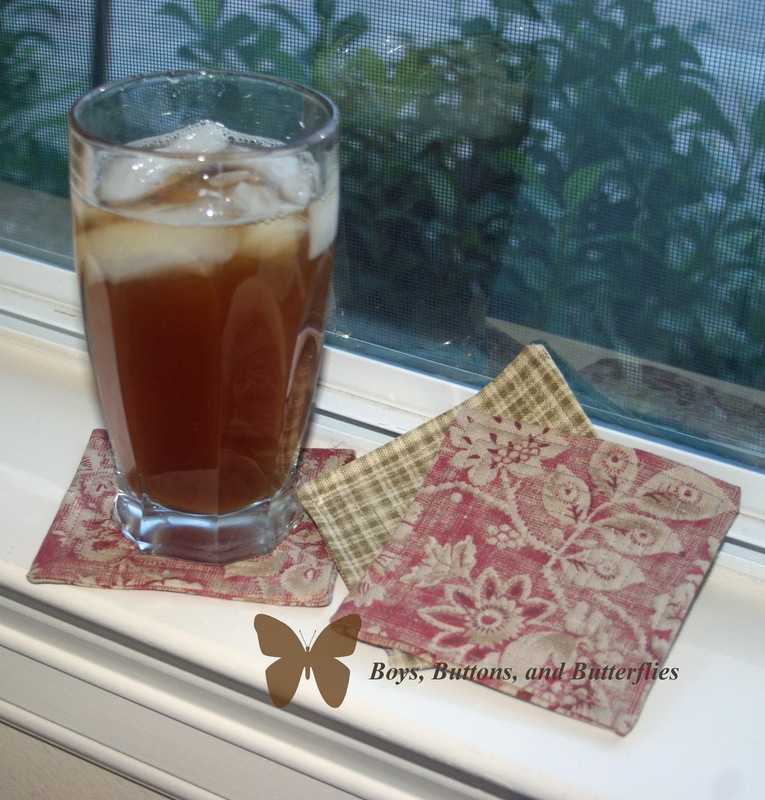 Make sure that your coaster is 4 inches square. Iron the end to keep the end secure. Step Seven: Pin the end. Step Eight: Attach your walking foot on to your machine if you have one. A normal foot is possible, but be prepared for possible snagging in your bobbin area because of the layers. 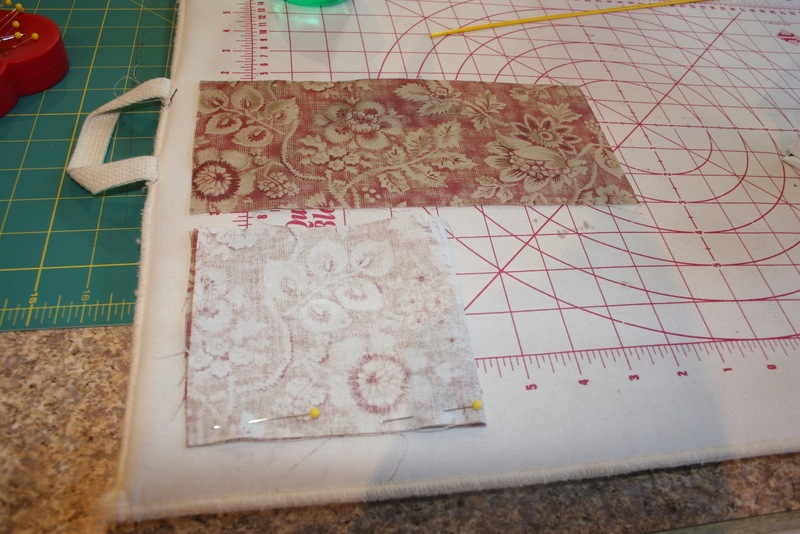 Step Nine: Start sewing at the pressed/pinned open edge of the coaster﻿. Start at approximately 1/8 inch from the edge. Make sure you backstitch to secure your work! 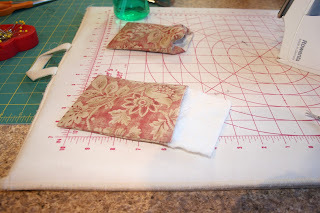 Step Ten: Sew to the bottom edge of the coaster and stop approximately 1/8 inch from the edge. Step Eleven: Make sure your you put your needle in the down position. 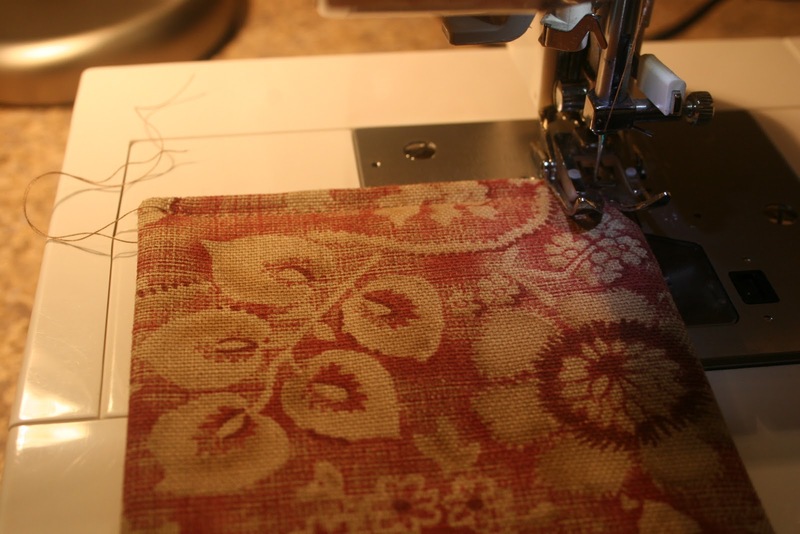 I am lucky to have the ability to preset my machine to always stop at a needle down position. *If you don't have this option, hand turn your needle to secure the needle in the down position. Step Twelve: Lift the presser foot and make a 90 degree turn. 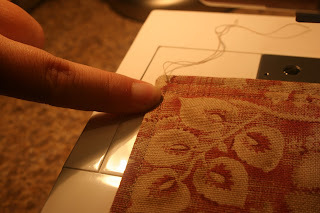 Lower the presser foot and continue sewing 1/8 inch away from the edge until you reach the next edge. Again, stop approximately 1/8 inch away from the edge. You will continue this procedure until you have made concentric rectangle/squares to the center. Make sure complete with a backstitch to secure your quilting! 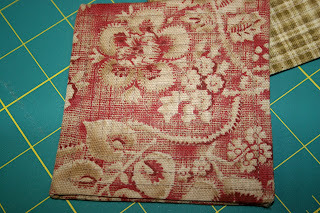 I don't know if you can see my thread well, but I am surprised how nice and flat the coasters out. I have no worries that my glass might spill over from the coaster being too fluffy. Double sided: I had some extra fabric, but not enough to make up for the length of 10 inches I needed. I took two squares of 4 1/2 x 5 inches and sewed the two pieced fabrics to make a 4 1/2 inch x 10 inch strip. 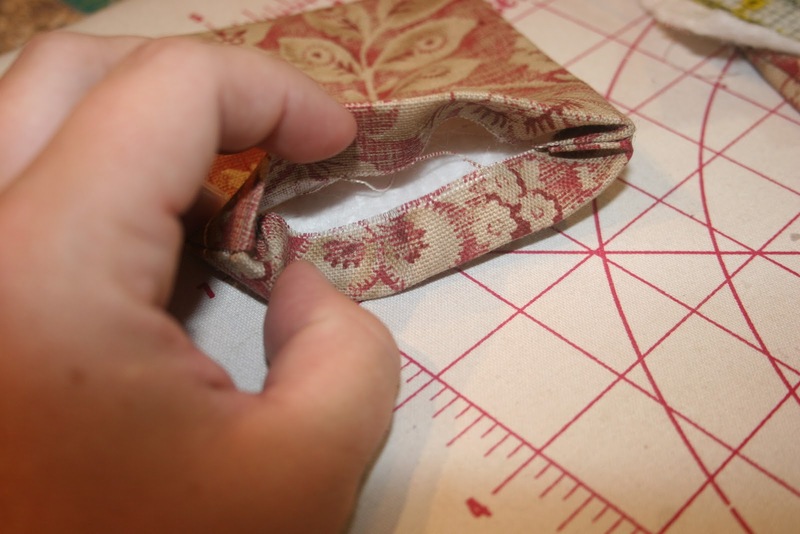 When I folded it, I made sure that it was on the seam line where the two fabrics met. Now I have a coaster that can be either fabric, depending on my mood! 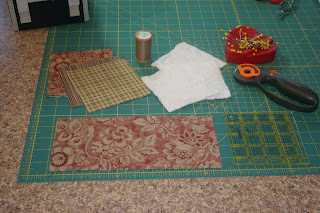 Gift ideas: I am thinking all of that holiday fabric I have been collecting over the years could make a nice set. I love decorating for all the different holidays, but don't like to overdo. I think these are a subtle way to have Easter, Fourth of July, Halloween, Thanskgiving, and Christmas make there way on our coffee tables! !